Chagdud Khadro was born in Port Arthur, Texas, in 1946. Thirty-one years later she left her life as magazine fact-checker and free-lance writer in New York City, bought an around-the-world air ticket, and went to Afghanistan. A rather colourful series of events led her to Nepal and to Chagdud Tulku Rinpoche. They were married in California in 1979. She has compiled his teachings on the Dudjom Tersar Ngöndro, the Longsal Nyingpo phowa, and the Apang Tertön Red Tara into commentaries and collaborated with him on his autobiography, Lord of the Dance. She now lives at Khadro Ling, Rinpoche’s main centre in Brazil, and travels and teaches, mostly focusing on the practice of phowa. 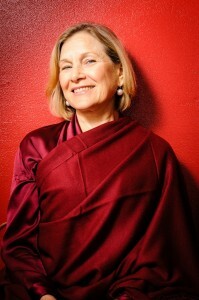 Recently, Barbara Lepani talked to Chagdud Khadro for View magazine about what it means to be both the wife and student of a great master, the role of women in Tibetan Buddhism, and about bringing Buddhism into the modern world. Khadro, what does it mean to be called Chagdud Khadro? In Tibetan khadro (or khandro; Skt. dakini) literally means “sky goer” and refers to a female realisation holder. The wives of lamas are often called khadro, as are female lamas. When I visited Tibet, I noticed that people called me Khadro, but I didn’t take it personally. It was a title that had more to do with Rinpoche’s stature than with me. However, when Rinpoche himself ordained me as a lama and suggested I use the name Chagdud Khadro, it became deeply meaningful—a constant reminder of my connection to him, to Chagdud Gonpa in Tibet and in the West, and to his lineage. Of course the name also inspires one to remember the great khadros of the past such as Yeshe Tsogyal and Machik Labdrön, as well as Chagdud Rinpoche’s mother, Delog Dawa Drolma, and his sister, Trinlé Wangmo, a wild dakini type who still lives in Eastern Tibet. What do you mean by a ‘wild dakini’ quality? What is the nature and flavour of this feminine principle in Tibetan Buddhism? Dakinis carry out the enlightened activities of the guru and not always in predictable ways. They embody selfless spontaneity in their conduct. Usually, we think of feminine as gentleness, docility, softness. We think of the lovely thangka paintings of Yeshe Tsogyal kneeling beside Guru Padmasambhava, looking up at him with longing and devotion, her hands in the gesture of prayer. But, if we read between the lines of her story, we find a very stubborn teenage girl, defying her parents’ wishes that she marry, and spurning her suitors, all warriors in the prime of their manhood. She frustrated everyone’s conventional expectations and they were quite cruel to her in return. However sweet her voice and personality were, her will was indomitable. When Padmasambhava departed for Ngayab, he left her behind to hide the treasure texts and to continue her dharma activities on earth. This is one of the most interesting moments in her life story, because we would expect her stoically to endure. Instead, grief-stricken, she throws herself on the ground, tears at her hair, scratches her face, and makes a huge scene. She cries out to him that he is her only heart, that he has too little compassion, that he is doing a terrible thing by leaving. As he is disappearing into the sky, he makes two final bequests to her, but she continues to weep and call out to him. At last, with the third bequest, the complete confidence of absolute guru yoga arises in her heart and she realises the illusion of being together or apart from the teacher. But also, by the spontaneous wisdom of her conduct, she has three more gifts from Guru Rinpoche to use for the benefit of beings. Chagdud Rinpoche’s mother, who was very beautiful, charming, and beloved for her compassion, was also unpredictable. I met an old monk in Kham who remembers her flinging her bell at him when he blew his kangling badly during a ceremony. Fifty years later, for him that moment was still vivid. I’ve had the opportunity to meet other great dakinis, including Khandro Tsering Chödrön, Sogyal Rinpoche’s aunt. She had a quality of totally transcendent sweetness and simplicity. Still, her real dakini quality is in the radiance of her spiritual realization, not some aspect of her personality. Machik Labdrön is one of the most famous historical Tibetan women practitioners. Her speciality, as you know, was the powerful Vajrayana practice of Chö which is designed to cut through and destroy ego. Do you think that ego manifests in a particular way for women, or that there are any uniquely ‘female’ qualities to ego that western women should pay more attention to? I am not sure about women in particular. All of us, men and women, have the three poisons, the seeds of endless confusion. Chagdud Tulku often tells his students that the most poisonous thing in relationships and in the Sangha is resentment because it distorts how we interpret even ordinary events and interactions. Everything starts to support our secret agenda of grievances. Another Sangha member might be in a foul mood for reasons completely unrelated to us, and we take it personally and stew around in negative thoughts and maybe retaliate, either by direct confrontation or by sabotaging them behind their back. It is better, wiser, to let it go, to figure that person is having a bad day and to wish them well. Especially in the Sangha, where we pray to meet again in lifetime after lifetime as a single mandala, we need to cultivate the same kind of long-term tolerance and affection that members of a big, bumptious family might have for each other. For people who have felt disempowered in their lives—and certainly many women have—it’s easy to cultivate resentments toward the structure of authority in a dharma centre, whether that structure is predominately male or female. A man once told Chagdud Rinpoche that Rinpoche’s activity would flourish in the West, that he would have thousands of students, that he would have dharma centres everywhere except for one big obstacle (two obstacles, actually): Tsering Everest, whom Rinpoche later ordained as a lama, and me. This man regarded us as a pair of dharma obstructers, demonesses. Rinpoche listened, but he didn’t change things because he felt that our motivation was pretty good, though not perfect, and that we were trying hard to carry out his activities despite our flaws and limitations. When I heard what this man had said, at first I laughed, because he had made Tsering and me absurdly large-scale and we weren’t. Later I felt more compassion, because I knew he suffered a lot of frustration from his projections. Basically, as soon as anyone understands that the root of experience is in his or her own mind and that the mind itself can be transformed through a whole array of brilliant, practical dharma methods, immense power comes from that understanding. This power is not dependent on outer circumstances, good or bad. When we check our own mind and apply the methods of dharma, we don’t develop a backlog of poisons, neither resentment nor anything else. Have you had any difficulties combining the roles of wife and student? Do you feel you’ve given your husband an unfair kind of power over you because he is also your teacher? Rinpoche and I met twenty years ago so of course there have been a lot of phases in our relationship, some of them difficult, especially at the beginning. I met him only a few months after I entered the Buddhist path and although I had immediate deep, intuitive devotion to him, I was very rough, capable of real shows of temper, and I had very little meditation. Still, I knew from the very beginning that my relationship with Rinpoche wasn’t going to be an ordinary relationship, and that helped in all the transitions that followed. For about four months we had a kind of teacher-student honeymoon during which I seemed to do no wrong. Rinpoche never criticized me. Then we moved into a phase of about four years in which I seemed to do nothing right. He constantly corrected me. In the shrine room, I sat in the back. In meetings I didn’t talk. We had fierce arguments and not always privately. I’m sure that they were hard for other people to witness, but for me they were like electrical storms. Afterward the atmosphere was really clean, and I can honestly say there was no resentment. We would be laughing ten minutes later. Still, it’s not so great to provoke one’s teacher. Looking back, I deeply appreciate Rinpoche’s patience. He was quite wrathful in the moment, but he didn’t cut me loose. The British sometimes call someone ‘a piece of work’. For Rinpoche I was definitely a piece of work. Inwardly what was happening was that a whole lot of concepts and habits were being annihilated, particularly my self-righteousness and harsh speech. I was learning how to check my motivation, how to see things beyond my own point of view, how to be patient and to wait, how to meditate in intense situations, how to speak and how to listen. I’m still learning these things. After I became comfortable in a subordinate position, he started to invest more authority in me. I had some resistance—part of me wanted just to take care of Rinpoche’s home and guests because I was confident in those skills and I liked housekeeping and cooking. Rinpoche thought I had ability as a writer and that any other activity should be secondary. He would explode, “You nothing doing! Only small-small cooking, cleaning!” As his English improved, he became more eloquent. He thought I was wasting my main opportunity to benefit others. What I actually was doing during that period was a lot of administrative work, which I wasn’t particularly good at. I didn’t know how to incorporate the skills of others, so I often felt overwhelmed with work, irritable, snappish, and bossy. Then I would despair of ever subduing my harsh speech, of being able to maintain smooth relationships in the sangha. Still, I’m glad I went through that, because I learned a lot about dharma centre administration and I learned to have a deep appreciation for administrators. When we moved from Oregon to California, Rigdzin Ling, in October 1988, my activity changed to managing Padma Publishing and writing, which, as Rinpoche had foreseen, gave me a genuine sense of accomplishment. When we moved to Brazil in late 1995, it involved another radical redefinition. I felt a real loss in terms of Padma Publishing and the translation committee, and also in terms of my old sangha. I had practised with some of those people for fifteen years and sometimes in retreat we were like one body, not a group, an absolutely seamless mandala. I didn’t think that I would find that again. In Brazil, Rinpoche encouraged me to teach more. He gave me ordination as a lama, then authorization to give certain empowerments. Again I had some resistance. At any given time he seems to have a bigger idea about me than I have about myself. But, it turns out that I love to teach, I love to work closely with a roomful of people, particularly if they are learning a practice. Sometimes that sense of a seamless mandala arises. As for his power in my life, of course he has power. It is tested, authentic, and entirely for my benefit. I hope to confer that power on him in lifetime after lifetime. What do you think he saw in you then, that led him to marry you? He says that when he first saw me, I was surrounded by a red radiance and he thought I might be some emanation of Tara. Later he joked with me by saying that he should have been warned by the red light of anger. I think he recognized my devotion and thought my heart was basically good. And that we had a strong karmic connection—after all, I proposed marriage to Rinpoche a couple of weeks after we met, which seemed natural then although it amazes me now. When you look back at your life as a student and spiritual practitioner, what do you regard as the most significant spiritual challenge you had to face on the path? Time management. It sounds like business jargon, but it has real significance in terms of the bodhisattva vow, which involves using each moment to its highest benefit for all beings. By that measure, I waste an incredible amount of time and often get side-tracked into unnecessary tasks. Only when I travel and teach as a lama, do the priorities remain clear. Now that you have been recognized as a lama, a spiritual teacher, do you feel you have a much larger responsibility? Yes. To have people rely on me spiritually to any degree is a tremendous responsibility, and I have an increasing sense of urgency to reach deeper levels of practice. Currently, in the dharma world, there is a great deal of discussion about the transition the Dharma is in the process of making from the East to the West. What is your point of view? You know, my feelings about Dharma’s transition to the West depend so much on which lens I am looking through. If I pick up some of the dharma magazines and read the debates carried on in articles and letters, sometimes it seems like we are falling into contentious factions. But if I read Padmasambhava’s biography and think about how difficult it was to establish the Vajrayana in Tibet, about the outright hostility and the subtle distortions that had to be dealt with, then I feel pretty optimistic about how the teachings are taking root in the West. Our problems are not of the magnitude faced in Tibet or even in India. Mostly I notice the influence of the teachings on the minds of individuals within the dharma. People enter with different degrees of readiness, based on their previous spiritual development, in this lifetime and in past lifetimes. Some struggle to purify tremendous negativity and have to pass through a lot of cycles of confusion along their spiritual path. Every increase in compassion and inner peace is a personal triumph. Other people hear high teachings just one time and the words resonate with a knowledge that until then lay dormant in their mindstreams. When this knowledge is stimulated, they develop very quickly if they find a qualified teacher to guide them. Because I’m mixed in with Western practitioners at various stages of development, I find a lot to rejoice about. When people fall away or take misguided detours, I pray they won’t get lost, that their connection eventually will pull them out of the ocean of samsara. We can’t give up on anyone. The short cut in the Buddhadharma is guru yoga. From the bottom of my heart, I hope every Buddhist practitioner finds the teachers with whom he or she has a karmic connection. Of course, there are some false teachers in the Dharma and some mishaps in teacher-student relationships. This means we should thoroughly explore our connection with a teacher before making a full commitment, not that we should allow our fears to cut us off from avenues to liberation. Those who deny the primary importance of a teacher can only be ignorant of what an authentic teacher-student relationship is. Through guru yoga, intellectual understanding evolves into meditative realization, and transitory meditative experiences evolve into recognition of mind’s absolute nature. Along that trajectory faith blossoms. We see that the greatest lamas demonstrate the greatest devotion to their gurus. This page was last edited on 13 April 2018, at 09:19.